The MSG Network didn’t pull any punches when listing the career accomplishments of former Knicks star center Kristaps Porzingis. 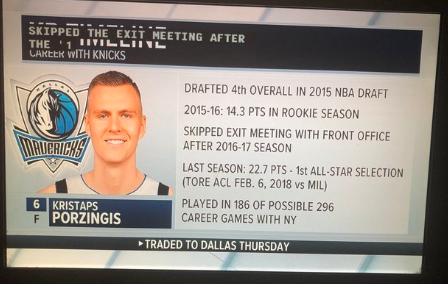 In an infographic featuring Porzingis, who was dealt to the Dallas Mavericks earlier this week, the MSG Network listed his draft position, some scoring numbers, how many games he missed with New York and bizarrely, that Porzingis skipped an exit meeting after the 2016-17 season. It is true Porzingis skipped out on a team exit meeting with front office brass in 2017. The 23-year-old was clearly frustrated with then-head coach Jeff Hornacek and then-Knicks president Phil Jackson. The team was being run into the ground and he wanted to avoid the organization’s dysfunction. It’s hard to blame him. When digging up facts about Porzingis’ Knicks career, the meeting is so far down the list it’s borderline irrelevant. Unless the folks at MSG are trying to make him look bad on his way out. The network’s pettiness is sad on so many levels.